On Thursday, the tech giant formally challenged a court order to help the FBI unlock an encrypted iPhone used by a murderous extremist in San Bernardino, California. Federal officials have said they’re only asking for narrow assistance in bypassing some of the phone’s security features. But Apple contends the order would force it to write a software program that would make other iPhones vulnerable to hacking by authorities or criminals in the future. Major tech companies are also rallying to Apple’s cause, and now plan a joint “friend of the court” brief on its behalf. Facebook said it will join with Google, Twitter and Microsoft on a joint court filing. A Twitter spokeswoman confirmed that plan, but said that different companies and trade associations will likely file “multiple” briefs. Apple filed court papers on Thursday that asked US Magistrate Sheri Pym to reverse her order on the grounds that the government had no legal authority to force the company to weaken the security of its own products. The company accused the government of seeking “dangerous power” through the courts and of trampling on its constitutional rights. The dispute raises broad issues of legal and social policy, with at least one poll showing 51 percent of Americans think Apple should cooperate by helping the government unlock the iPhone. 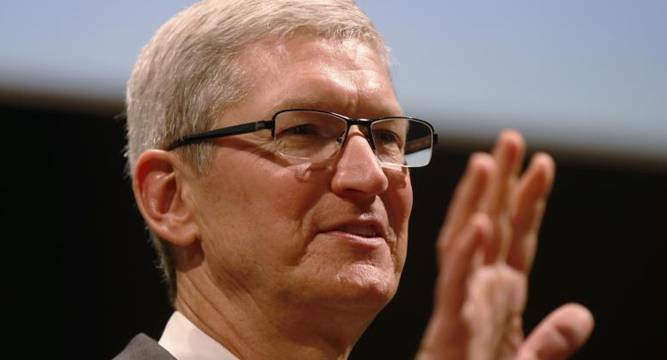 But it’s unclear how the controversy might affect Apple’s business. Analysts at Piper Jaffray said a survey they commissioned last week found the controversy wasn’t hurting the way most Americans think about Apple or its products. At least one shareholder at yesterday’s meeting voiced support for the company’s stance. Cook offered only brief remarks about the FBI case, and most questions from shareholders concerned other aspects of Apple’s business. But the CEO won praise during the meeting from the Rev. Jesse Jackson and Cindy Cohn, executive director of the Internet rights group the Electronic Frontier Foundation.